In the autumn of 1942, Cambridge University instituted its first Professorship in American History. Henry Steele Commager of Columbia University, New York, was invited over to blaze the trail but he stayed only one term and was then asked to nominate his replacement. The man he selected was one of his Columbia University colleagues, a Texan named J. Frank Dobie. It seemed that Commager was well aware of Dobie’s ignorance of ”genuine history” but assured him that such knowledge was unnecessary when teaching novices at Cambridge University. Commager told Dobie, who was ”too old to fight” in the US forces, not to concern himself too much as virtually all the young men were in the armed or technical services and the young women in auxiliary branches and so whoever he ended up teaching would be absolutely at his mercy. A letter from a fellow Texan based at Oxford University that encouraged Dobie to make up his own definition of history and ”come on over”, soon helped make up his mind. At two o’clock on the afternoon of 6th October 1943, Dobie stepped out of a taxi in front of Emmanuel College, Cambridge. 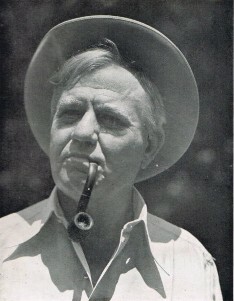 Never intending to set out to write a book about his life at Cambridge – indeed he wrote ”I proposed not to add to the books on England” – Dobie eventually put pen to paper because ”experiences within myself as well as without made me want to say something.” The result was A Texan in England which was published in May 1946. It is Dobie’s love of one pub that I hope will be of interest to visitors to the PHS website. The Baron of Beef, out of bounds for American soldiers; The Angel, where soldiers are too thick for anybody else to get in bounds; The Castle, where the matured barmaid combines dignity with easy welcome; The Jug and Bottle, where citizens take their pitchers to be filled; The Red Cow, too cavelike for cheer; The Bun Shop, often in stock when other pubs have run out but too garrulous for conversation; The Hat and Feathers, too far away; The Little Rose, just what it should be. 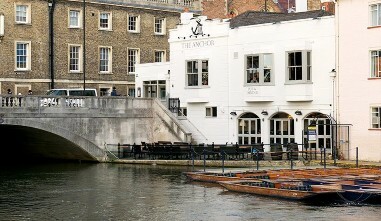 Of his discovery of the Anchor in Silver Street, by a bridge and a fall in the River Cam, Dobie said, ”after I found my place at The Anchor, I always felt I was missing something good in life if I went anywhere else.” He had discovered the homeliness and the comfort of the traditional English pub. He felt secure there and when darkness began to fall and blackout curtains deprived him of the view of the river he merely turned to look into the blazing fire in the inglenook. The Anchor was to become his ”refuge” during his time at Cambridge. Unless the weather was bad he would watch young men and women in punts on the river. Dobie wrote of this ”How beautiful the water dripping from oars is in the slant of sunshine!” With ”a contented white cow” moorhens and swans with ”their eight half- grown grayish cygnets” completing the view, Dobie painted an idyllic English scene from the pub window. J. Frank Dobie returned to America after only one year in Cambridge and decided to write a book. The Anchor was so vivid in his memory that he devoted a whole chapter to the pub that acted as his ”refuge” during his stay at Emmanuel College. His ”refuge” still stands today and is as popular as ever. The description on the pub – website in 2010 stated that the Anchor was ”the best place to relax, chat, enjoy a pint of fine real ale, try a traditional English Sunday roast and watch the punts float by on the river Cam” with ”stunning views” could have been written by Dobie himself. Of this I think Dobie would have approved. The original version of this article appeared in the Pub History Society’s Newsletter Summer 2008. What we’re doing and when we’re doing it. You might even find a date or two for your diary from other like-minded groups. More details can be found by following the link below. Becoming a member of the Pub History Society is a great idea. You’ll have access to all of our back issues of our newsletter and even a downloadable bibliography should you need it. More details can be found by following the link below.